La Fuerza del Tambor is a live recording of the power of the drums to call the Orishas. This DVD documents the Afro Cuban folkloric ritual music of the Santeria religion as played in Matanzas, Cuba, the region considered to be la fuente (the source) of the Afro Cuban religions in Cuba. Eight selections from authentic public drumming celebrations illustrate Afro Cuban folkloric music as it is played in the religious (vs. tourist) environment. In addition to the traditional Lucumi bata drums, the DVD also includes rare footage of the unique Lucumi Bembe Macagua drums and an unusual segment of Palo Mayombe songs accompanied by Aña. Lyric subtitles are included for all the songs. Interviews are in Spanish with English subtitles. "This video places you face to face with the drummers: listening to them answering central questions, demonstrating rhythms, and explaining historical details. Surprisingly, all of a sudden you find yourself inside of real Santeria ceremonies! [T]his video felt like a 1:30-hour trip to Cuba. There is no reason not to give it five stars. 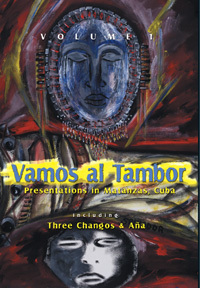 Vamos al Tambor is a live recording of presentations to the sacred bata drums of the Santeria religion. The DVD is 90 minutes long and includes two separate presentations, both of which were filmed live in Matanzas, Cuba. Three Changos gives you an intimate view of the presentation of three Iyawos (new initiates of the Santeria religion) to the sacred bata drums and the community. The presentation is done Matanzas-style and includes a complete oro cantado (cycle of songs) to all the Orishas. The segment culminates in a powerful call to the Orisha Chango to witness the crowning and presentation of the new kings. Aña shares the relatively rare presentation of newly consecrated bata drums (Aña, pronounced an-yá) and drummers (Omo Aña) to the drums that gave them birth and to the community. Bata y Bembe de Matanzas features a complete cycle of songs for the Orishas of the Santeria religion. The CD includes a complete oro cantado (sung cycle of songs) for all the Orishas, as sung and played during a presentation to the sacred drums in Matanzas, Cuba. In most cases, several songs are sung for each Orisha. The cycle culminates in a powerful rendition of a classic song for the warrior Orisha Chango. The CD also includes two tracks of the sacred Lucumi Bembe Macagua drums, a unique set of drums only heard in Matanzas, played together with the bata drums and then alone.